Mathura, a city of great antiquity on the Jumna some 100 miles (161 km) south of Delhi and a prolific centre of sculpture for centuries, was of immense importance during the Kusana period (1st-3rd centuries A.D.) in the development of Indian sculptures. 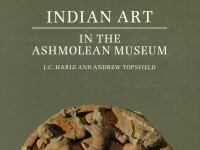 Its abundant remains have provided invaluable information about iconography, religious practices, holy places and shrines. 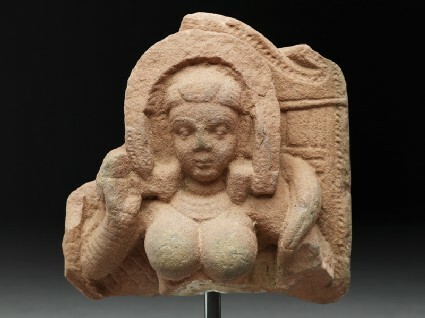 Hindu and Buddhist as well as Jaina, at a crucial stage of their development. 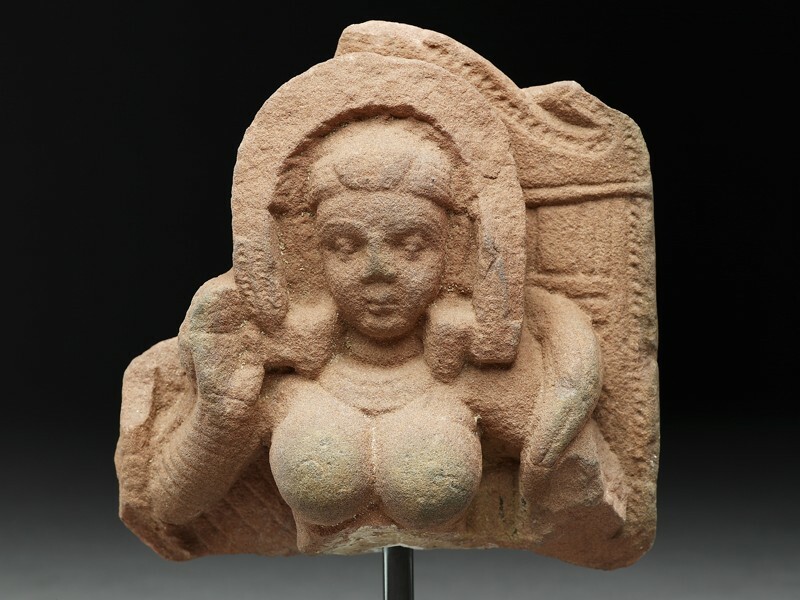 While Mathura probably preceded Gandhara in producing images of the Buddha, its sculpture is probably best know for its exuberant representations of alluring women, both goddesses and the denizens of one or other of the several heavens, the latter often nearly life-size. This little fragment of a stele, on the other hand, undoubtedly represents one of the former, making as she does the gesture of abhaya (“do not fear”) with her right hand. This hand has not been detached from the rest of the figure, the support behind it bearing cross-hatching to imitate a cushion and its fabric covering, a typical device in Kusāna Mathura. Also typical of these feminine figures is the way the hair is dressed, with a central pompom, a style almost certainly deriving ultimately from Rome. The so-far unexplained arch or canopy enveloping the head on the relief occurs frequently in representations of goddesses in Mathura during the Kusāna period; but with the left hand missing, it is not possible even to guess at the exact identity of this little deity. The presence of a long trailing scarf as seen over her left shoulder suggest that she was standing. Two features suggest an early date in the Kusāna period. One is that the hand in abhaya is turned slightly inward, the other is the joyous open expression of the face, unmarked by some of the stylistic mannerisms of the later Kuṣāṇa period [see EA1963.27 & EAOS.38a].